Petra Diamond's first quarter revenue fell by 17 per cent to $78.7 million after the Tanzanian government seized one of its consignments on allegations of underdeclaration. President John Magufuli said he will renegotiate the gold, diamond and tanzanite mining agreements to ensure that the country gets better terms from the miners. "Revenues fell from $94.8 million to $78.7 million as there were no sales from Williamson in Tanzania included in the revenue stream due to a parcel of diamonds from the mine being detained by Tanzania," the firm's chief executive officer Johan Dippenaar said. A week ago, Petra received authorisation from the government to resume diamond exports and sales. Already, a parcel of 40,000 carats from the Williamson mine has been shipped to the company's marketing office in Antwerp, Belgium. "We also remain engaged with the Tanzania government about the first parcel of diamonds in order to reach a satisfactory resumption, which would leave about 111,000 Williamson carats available for sale. This is not included in the quarter revenue numbers to date," Mr Dippenaar said. The Tanzanian government confiscated a consignment of diamonds from the Williamson mine, which is majority-owned by Petra, alleging that the company had underdeclared the value of the stones by about 50 per cent. 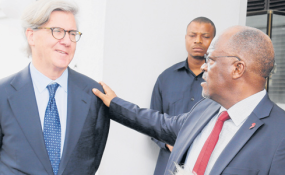 Two weeks ago, while overseeing the signing of an agreement between his government and Barrick Gold, the owners of Acacia mining, President Magufuli instructed Justice and Legal Affairs Minister Palamagamba Kabudi to ensure that other mining firms align themselves to the conditions that Acacia has agreed to. "I would want to see all other gold mining firms follow suit and append their signatures to this kind of agreement. The same should go for diamond and tanzanite mining firms, which should adhere to this arrangement. Those who don't want this, can leave. We would like to see Tanzania benefit more from its resources and such kind of agreements will guarantee that," President Magufuli said. Meanwhile, Petra's debt continues to rise. The London-listed firm said its net debt had risen to $614 million, from $555 million as of June 30 due to no sales from the Williamson mine during the period. The company currently has undrawn bank facilities of $20.9 million, up from June's $5.6 million, with an additional cash balance of $125.8 million, down from $203.7 million in June. Early this month, Petra announced that it was likely to breach key debt covenants with its lenders as a result of the labour disruptions in South Africa and the seizure of its $15 million consignment by Tanzania. "The compliance with the two Ebitda (earnings before interest, tax, depreciation and amortisation) -related maintenance covenant measurements related to the senior debt facilities for the 12-month period ending December 2017 has been placed at risk," the company said. Petra's chief finance officer Jacques Breytenbach said that they expect to reduce net debt to $620 million by December on the assumption that $30 million is realised from Williamson during the second quarter. In September, the company suspended operations at one of its mines after a dispute with the government, becoming the second mining firm after Acacia to have its minerals seized. The same week, Tanzania announced that it would nationalise the diamond consignment owned by Petra that was en route to Belgium after it was said to have been underdeclared by more than $14.7 million. "While Williamson Diamonds Ltd declared in its documentation that the value of the diamonds was $14.798 million, a fresh valuation done by the government established that the actual value of the diamonds is $29.5 million. Legal action to be taken includes the nationalisation of all the diamonds seized after it was established that there was cheating involved in declaring the actual value of the minerals," Tanzania's Finance and Planning Ministry said in a statement at the time. The Williamson mine, from where the diamond consignment originated, is majority owned by Petra (75 per cent), with the other 25 per cent owned by the Tanzanian government.